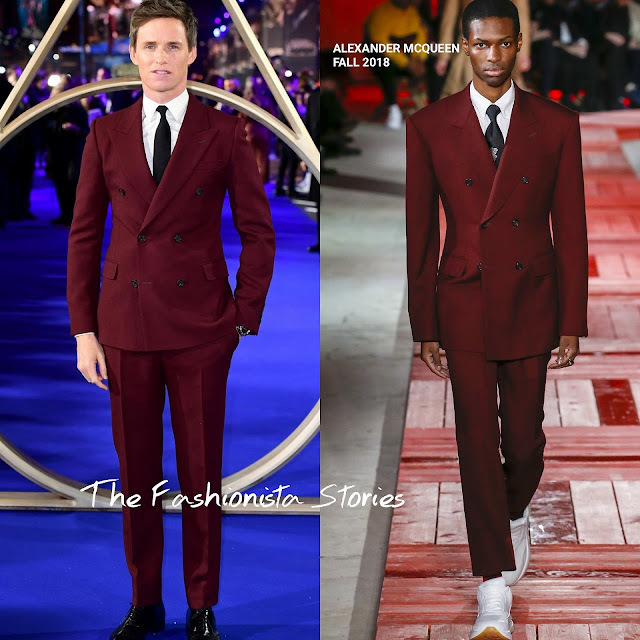 Eddie Redmayne once said that he doesn't use a stylist, that he relies on the designer's to dress him and I must say, he tends to look sharp. He attended the premiere of 'Fantastic Beasts: The Crimes of Grindelwald' at Cineworld Leicester Square yesterday evening(November 13th) in London. Wearing another ALEXANDER MCQUEEN look, he wore a FALL 2018 burgundy two-piece, double breasted suit which he teamed with a white button down shirt and a black tie. This is once again another sharply tailored look that Eddie is rocking. However I wish he kept the runway's tie which featured silver metallic flowers because it added a touch of charm to the suit. That small detail doesn't negate how much I love this look.